The City of San Diego is underway with the Palm Avenue Revitalization Plan, which will be used to guide future urban design, streetscape and mobility improvements along Palm Avenue within the City of San Diego. 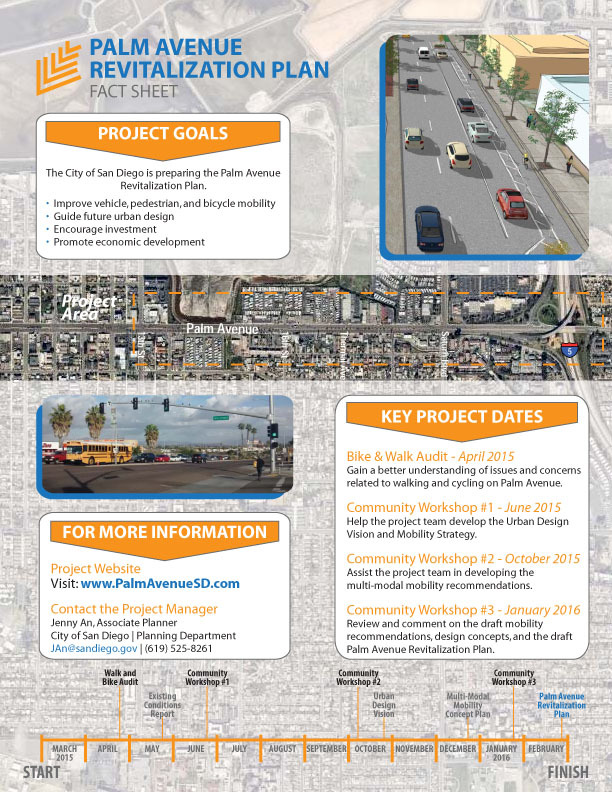 The project website, www.PalmAvenueSD.com will be regularly updated to provide an opportunity to view draft materials and learn about project updates. Please see attached for the project fact sheet (English and Spanish), and please forward it along to any people or organizations you think may be interested in the project. Additionally, we will be hosting a walk and bike audit event in support of the project on Saturday, April 25, from 10:00 AM to 1:00 PM. Please see attached for the walk and bike audit flyer with more details. The event will serve to help publicize the project and gather input regarding what changes community members would like to see in the future. We would greatly appreciate your attendance and participation in the event, or any assistance you can provide in publicizing the event.